Regular Rate $1580 . Today Only $799! Melody Maker Cancun is a multi-sensory experience. When visiting paradise, there's nothing more important than your entertainment and satisfaction. That's why Melody Maker Cancun features exclusive rooms and suites with everything you need to make it unforgettable. Your stay with us is more than a hotel stay - Let us entertain you. Stretching along the Atlantic Ocean, Melody Maker Cancun pairs the lifestyle and excitement of a beachfront hotel with the amenities of a luxury Resort, creating a Miami meets Vegas style. 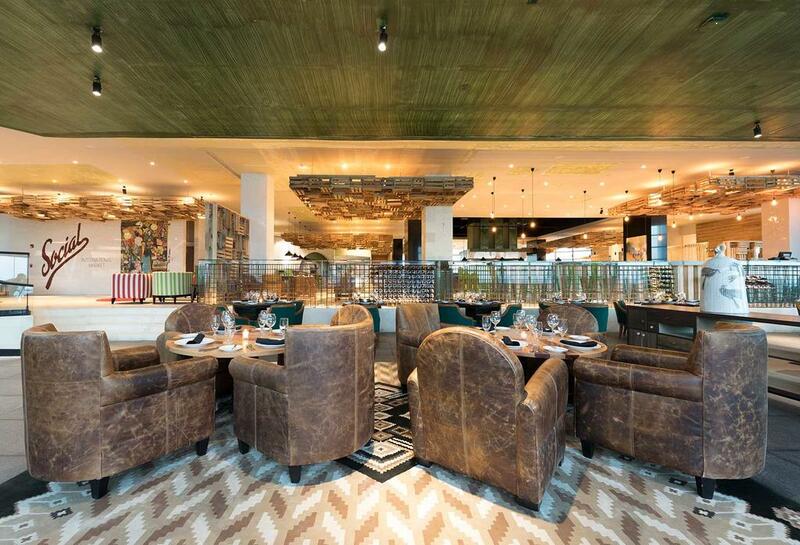 Spaces are driven by design and the thrill of the best entertainment epicenter in Cancun. The ambiance has been realized for the needs of a new generation including Oceanfront accommodations, a luxury Spa, a state of the art Gym, themed Restaurants and our distinguished Delirio Day Club. 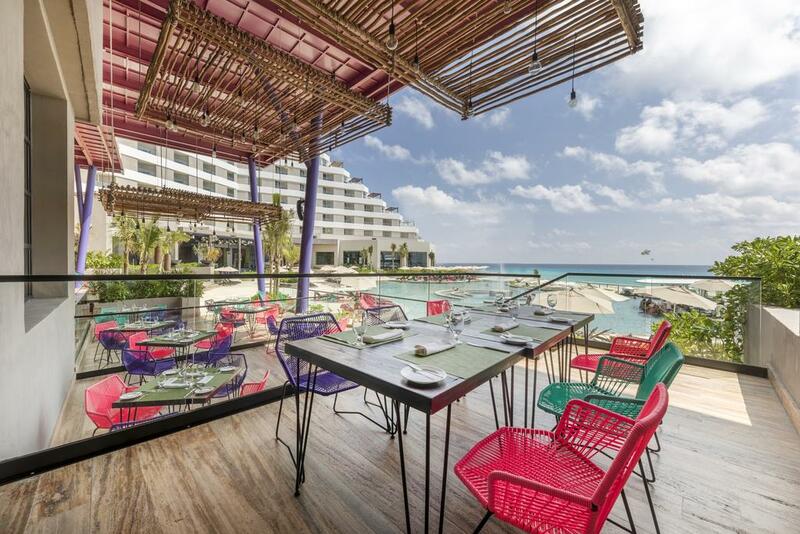 Located oceanfront and walking distance to major Shopping Centers, the best restaurants in the Hotel Zone, tourist attractions and nightlife, Melody Maker Cancun offers stunning views of the Caribbean Sea and the Nichupté Lagoon and the best Day Club in Cancun "Delirio". Just 5 minutes walking from La Isla Shopping Mall & Fashion Avenue and the newest Cancun Eye, Melody Maker is conveniently located in the most interesting section of Cancun's Hotel Zone. The resort is situated just 15 minutes away from Cancun International Airport and 20 minutes from Cancun's Downtown. The hottest nightlife spots are just 10 minutes away by car. The best time I ever had on a vacation trip in a long time. Hotel is very modern and the food is simply incredible. They have all types of restaurants with different menus from all over the world and the service was excellent. All the staff were very friendly and kind and carrying from the front desk. Ricardo Salas who helped us with every thing we needed.The pools and beaches was another spectacular place we visited. We stayed in and at the pool's bar. I am very satisfied with my stay. These employees are the reason that we are going back over and over again. Stylish guestroom overlooking the lagoon, furnished with two double beds or one king-sized bed. Equipped with a plasma satellite TV, complimentary WIFI internet access, direct dial cordless telephone, Art from famed Mexican artist Yuri Zatarain adorns the rooms. Amenities include plasma satellite TVs, MP3 docks with complimentary high-speed Internet access and direct dial telephones. All rooms feature stocked mini bars, laptop-sized safes, an aromatherapy menu and bathrobes and slippers. Additional amenities include 24-hour turndown service, bathrooms with rain showers. You will be pampered with Gourmet services and amenities such as beach butlers, concierge, turn-down, and Gourmet cuisine. The latter, which is the foundation for the Gourmet Inclusive Experience, has been lauded Superb, Best in class, Decadent and Outstanding. To us it simply means creating delicious meals in pleasant environments by our star chefs. Here, you will be indulged with Gourmet hospitality every moment of your stay. My wife and i visited this hotel from October 5th-12th. The hotel was beautiful and had a wonderful night life. The restaurants were also very good, be sure to make reservations for the Mediterranean and Asian restaurants, in our opinion these two were the best. If you stay during the weekend, be sure to reserve a cabana at the adults only pool, as this pool turns into a mini vegas themed party. the service we received from all employees was excellent, but Hever Velasquez (bar tender) was amazing. He is super outgoing, made us feel welcome and was constantly going above and beyond to make our honeymoon special! "The place you won't want to leave." A beautiful view, an awesome experience and a wonderful atmosphere. From the bell men at the front door to the security gaurds that roam the facility a great experience from every one. Firstly the hosts Andreas, Leo, Patty and Montse thank you for all ways being able to guide us or give us directions or help to book restraunts. Your always very helpful and made a effort to make sure the holiday is going great. Secondly the pool staff that looked after us while by the pool or beach Manuel and Veronica your always so happy and were there when a tequila was needed from the heat. Great service and a all round awesome experience cause you made the effort to always check when ever you walked past even if weren't in your section. The bartender baldo at beach house pool bar. Always got a special drink up your sleeves when you wanted to try some thing different thanks from my hangover. If you want a awesome hotel that can either be a romantic holiday like our honeymoon we just had there to a weekend away with friends then I would recommend me cancun to any one. I will see you all again next year as this was my favorite holiday I have been on. Perfect hotel for a relaxing holiday. Recently stated there for a 10 holiday and would recommend any body stay there. Special mention to the hosts there that helped us thru every thing from dinner reservations to general knowledge on cancun Leo and Patricia. Also Veronica and Miguel from the waiters service by the pool and beach for awesome service and personalizing the trip by making an effort to get to know you. Look forward to seeing them in the near future. After reading countless reviews, we decided to give this hotel a chance. We were very happy with our choice. We got the Passion Suite room, and I believe that played a big part for the service we received. You are given different colored bracelets that determine the type of "all inclusive" experience you will be receiving. We had the black color, which meant we could drink top shelf liquor, get chef specialties at the restaurants, free bali beds at the adult pool area, room service without charge, and private check-in/check-out. I'd like to mention a few names. Andres and Paty are VIP hosts, and they made sure to check on us daily. They are amazing and provided exceptional service. Daniel (Danny) was our pool server the majority of the days we were there, and he deserves to be recognized. Drinks ordered the day prior were ready for us when we got to our day beds. We'd never have an empty drink in our hands. Our favorite restaurant was Silk, and the least favorite was Salt. The food at the beach house was delicious. My fiance ordered the fish tacos every day, and I always asked for the chicken adobo that came with warm tortillas. I was disappointed one of the restaurants was being remodeled, so we didn't get more choices for dinner. The weather permitted us to have a dinner on the beach one night. I enjoyed it for the experience, but the chairs like others have said are uncomfortable after sitting on it for an hour. We didn't care that we weren't there during the weekend as we come from a party city. The hotel was relaxing, and we enjoyed our stay. I'd recommend to upgrade if you can because that can make a huge difference at a hotel with different all inclusive tiers. "Wonderful Vacation begining to end"
"Amazing for couples or group of friends"
It's an amazing hotel if you go with your group of friends to lets say a bachelorette or bachelor party because is very well located and also inside the hotel you will have a lot of fun. And if you go with your couple is also really nice. Is not a hotel to take children. First time in Mexico and the Me by Melia totally exceeded our expectations. The entire staff was so friendly and accommodating, they even remembered our names. The restaurants were fabulous, the service exceptional, and the hotel itself was beautiful. The only thing I didn't care for, was the background music played throughout the resort. Rather than upbeat Caribbean/tropical music, it was very low key, sleepy music like you'd expect when going for a massage or something, but we will definitely go back! We went to Me Cancun for our honeymoon for two weeks. Everything was amazing starting from the beginning to the end. First of all, excuse my English because i'm french Canadian. The hotel is very beautiful, the room is extra clean, very nice job from Vicri, our roomade. We had 3 restaurants, Salt , Silk , Beach House and buffet near the pool 2 times by week. Every restaurants are a la carte menu. For people who love buffet every day, it's not the place. The food in general was excellent with a lot of different taste. A very special thanks to Anthony at the Salt restaurant, the best waiter we nerver had in all trips we made (25 trips).The style of the hotel is very comtemporaily. The beach is amazing with all service you need directly to your lounge chair, waiters are doing their best to satisfy you for foods and drinks. Ask for Manuel for one of the best beach waiters. Edouardo is in charge of restaurants, a very nice guy who speak with us in French. Free Wi Fi all around the hotel and the beach. We hope go back there soon! Thanks all the staff for maked our honeymoon a memory forever. Loved this hotel, directly on the beach with a great pool area and fantastic staff. We were well looked after and would definitely go again. We were looking for a good place to relax and unwind and we hardly left to see the rest of the area. This place is mainly geared towards couples or friends rather than families. We left feeling very pampered and felt the cost of the mid-price room was well worth it. No hesitation in recommending. We went to this resort for a guys golf weekend and it was perfect. The resort is adult orientated, so if you have kids this is not the place for you. If you like a party place this is the perfect hotel. There were different party's going on daily, but the one on Friday night was unbelievable! Not sure if they always do this party out on the beach, but there was a professional DJ, dancers, sponsors like red bull who kept the drinks flowing, and a fashion show with tons of models. The food and service were both way above expectations for a relatively inexpensive all-inclusive. Every meal had a great selection and the food was awesome. Drinks were also good, but you have to find the brands that come with the all-inclusive and ask for the better brands or they will pour bottom shelf drinks. Get the ocean view room, totally worth the little extra! Rooms were nice size and very clean. Hope this helps.... Will definitely return to this resort. "Great beach, Silk restaurant is the best"
We had a great stay here this summer, the location is great & the rooms are a good size & clean & what a beautiful beach... We ate in Silk as we loved their sushi... can't wait to return & at the weekend so we can party. My wife and I spent 6days at the ME in Cancun mexico recently and I have to tell you that it was an unforgettable experience. The service was excellent at check in and JJ of the bell staff esccorted us to our room and answered many questions about the hotel and cancun in general. Shortly after check in Karin of the concereige desk stopped by with a nice note form the hotel staff and chocoaltes as a welcome and a congratualation of of 10th wedding anniversary. During the week our experience at the pool and the beach were outstanding. We were waited on hand anfd foot by Willie and Veronika of the wait staff, and actually never needed to walk to the bar at any time we did not want to, including food, not just beverages.The bali beds were awesome and comfortable and we took full advantage. Our dining experiences were great consisting of Mexican, Mediterranean, and International buffet and a superior Asian cuisine retaurant.What I iked most in additiona to the 24 hour room service was the overall attitude and the willingness by the staff to make your visit to this resort an experience to never forget.I cannot wait to go back. Loved my stay at Me Cancun. Staff is so attentive and friendly. Pool area is great with the bar right there. Close distance to the nightlife as well as the bus stop. Easy check in and check out. Will def stay here again!! I took my boyfriend on a surprise trip for his bday. we only stayed 3 nights and we've been to can can plenty of times but it was our first to Me Cancun! We loved everything about this resort! Salt and silk restaurant are the best!!! We didn't want to leave! Our room was amazing not the bed view but we're we never in there anyway lol. All the staff is very nice and helpful! We also did dinner on the beach it was very romantic! I would def visit this resort again no question!! Our stay was the best, just be there from 5-9 October and had a great time, we returned after a year in which we celebrate our honeymoon, a year thought the service would change, so, even better !!! They make every guest feel important, the have wonderful food and personal care, lets say, sublime. 100% recommended. A single detail, we found the Water Grill Restaurant in construction, a shame !!! That's all, everything else wonderful !!! Pd. Try the Sushi Acevichado, awesome !!! This hotel was great! We were there over the weekend and had amazing service. There were 2 staff members which did a great job. Mauricio from rose Bar and Julio at the breakfast restaurant. Great hotel for single young professionals. "Great service from a great member of staff"
I stayed on a suite back in September and was greeted with a huge smile from my concierge, Patty. She was friendly and welcoming and was there to help with everything including advice on tours. I would not hesitate to stay in this hotel again as it is not only beautiful but has some wonderful members of staff. Keep up the good work! The room and its decor was gorgeous! All of the staff, each and every one, was super helpful and a pleasure to work with and they all spoke English! The entrance to the hotel was breathtaking and exquisite! The property, pool and landscaping was beautiful! Now, having said that, the room had neither micro wave, coffee pot, nor even a mini fridge. Granted we did not pay for a suite, but even in a bestwestern, I can get those in a basic room. Regular Rate $ 1580 . Today Only $799!